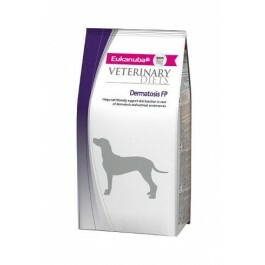 Eukanuba Veterinary Diet Dermatosis FP for Dogs contains a novel protein source (fish) and carbohydrate source (potato) and a high level of essential fatty acids. The adjusted ratio of omega fatty acids helps to support a healthy skin and coat and reduce inflammation. Dermatosis FP contains a natural fibre blend, including clinically proven beet pulp and. The inclusion of prebiotics (FOS) help to support the health of the gastrointestinal tract by promoting the natural balance of the intestinal microflora, which help optimise nutrient absorption. For food intolerances Dermatosis FP should be fed for 3 to 8 weeks and if signs of intolerance disappear this feed can be used indefinitely. For support of skin function Dermatosis FP should be fed up to 2 months, for extended use beyond this we recommend that you please consult your veterinarian. This diet has been formulated to provide all the nutrients needed to support overall health and well-being fo your dog. Feeding Instructions: It is recommended that a veterinarian's opinion be sought before use or before extending the period of use. Your veterinarian may suggest specific feeding instructions for your dog, or ask you to follow the standard portions shown in the feeding chart. Recommended time for use: up to 2 months for support of skin function in case of dermatosis and excessive loss of hair. For the reduction of ingredient and nutrient intolerances 3 to 8 weeks: if signs disappear this food can be used indefinitely.